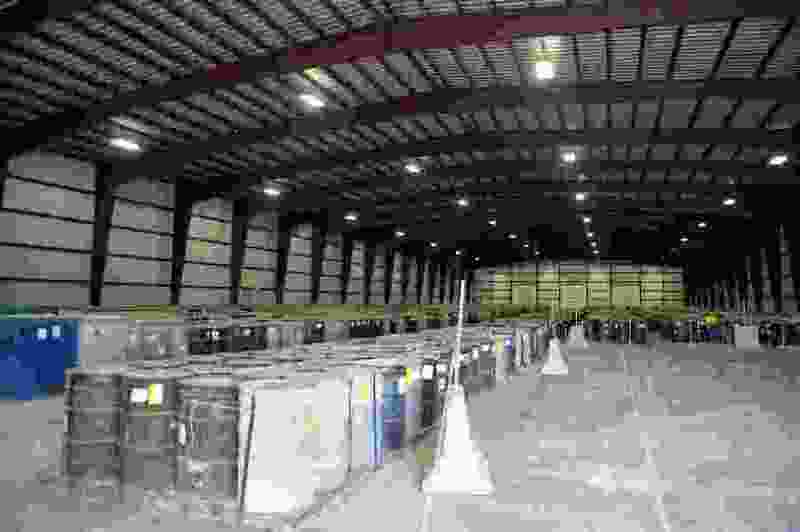 (Photo courtesy of EnergySolutions) In this 2015 photo, EnergySolutions is temporarily storing barrels of depleted uranium in a controlled warehouse at their Clive facility in Utah's west desert. The Utah Department of Environmental Quality is finalizing its regulation for how this waste will be processed. It will eventually be buried in a cell at the Clive facility. Rep. Carl Albrecht, R-Richfield, said his HB220 is needed to square Utah regulations with anticipated revisions to federal standards from the Nuclear Regulatory Commission. The measure would require the Utah Department of Environmental Quality to base its approval of waste-acceptance proposals on “science, human health, environmental safety, unique site capabilities, geology and geography” as opposed to relying on an “antiquated” system of A, B, C waste classifications, the retired power company executive told the House Natural Resources, Agriculture and Environment Committee. Under current law, Utah’s waste facilities, such as those operated by EnergySolutions, may accept nothing hotter than class A waste. DEQ is nearing the end of a seven-year performance assessment of the ability of EnergySolutions' dump to safely store up to 700,000 tons of depleted uranium — material that is relatively harmless now but becomes increasingly more dangerous over thousands of years, far hotter than B or C waste. The environmental group HEAL Utah argues HB220 could require regulators to consider depleted uranium as class A waste — ignoring its increasing toxicity — because the bill would require waste to be classified at the time of its acceptance. The Legislature passed the 2005 ban on class B and C radioactive waste with bipartisan support and the concurrence of Envirocare, the waste-handling company now known as EnergySolutions. Casey Hill, EnergySolutions' lobbyist, said his client’s depleted-uranium proposal would still have to complete a rigorous review, expected to be completed sometime this year, regardless of HB220. Tooele County Commissioner Shawn Milne, whose county hosts EnergySolutions' Clive site and other hazardous-waste repositories, endorsed the bill. The heavier-than-lead waste the company seeks to accept comes from Department of Energy sites where uranium has been enriched to make fissile material to fuel reactors and weapons. Stored in aging casks in a granular form, depleted uranium is the byproduct of this process and has been used in military-grade projectiles that penetrate concrete and armor. Albrecht’s bill was introduced on the heals of DEQ’s recent decision against EnergySolutions' request to accept old projectile tips the U.S. military has long stored at the Tooele Army Depot. That decision upset Milne and other elected officials. Before the 2018 Legislature, EnergySolutions ranked as the single largest donor to sitting lawmakers’ campaigns, pouring in more than $67,000. Legislators approved — and Gov. Gary Herbert signed — a measure granting the company a $1.7 million break on state regulatory fees.